At Action Wildlife Removal we often get calls from clients suspecting there’s something dead on their property. The idea of a dead wildlife in or around our property may be unpleasant, but it does happen. The presence of a dead deer in the home can be disturbing; fortunately, Animal Wildlife Removal technicians have the experience to quickly and professionally remove deer carcasses. Because deer carcasses are usually quite heavy, smelly and torn apart, they may attract coyotes and may also be contaminated with contagious diseases, it is recommended to hire professional wildlife removal services. Our deer carcass removal services are simple a phone call away. Call us now : 647-700-4948. How Did a Dead Deer End up in My Property? Deer may die due to natural causes, getting hit by a car or getting attacked by a predator. Automobile accidents are one of the most common causes of deer death. In most cases, a deer that has been under the impact of an automobile accident develops internal bleeding and other life-threatening conditions. Searching for a place to rest, an injured deer may end up in your home’s backyard or a shade close to your office building. Can I Remove the Dead Animal Myself? A dead deer can be quite heavy, making it a strenuous task to move it. Removing the animal all by yourself will require you to find a place to dispose of its body. If you are planning to drag it to the far end of your property and let nature take care of it, you must know that this will eventually result in an awful smell as well as potential health issues. It can get messy too, especially if you are dealing with a deer injured in an automobile accident. How Can I Get Rid of a Dead Deer in My Property? It’s best to call a professional for deer carcass removal. If you live in Mississauga, Brampton, Guelph or GTA, and need prompt and professional removal of deer carcass, contact Action Wildlife Control. Our technicians will be happy to remove dead animals from your residential or commercial property. 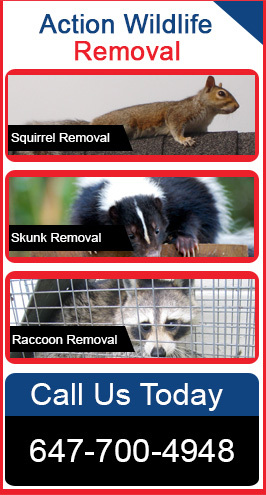 Schedule a wildlife removal service.